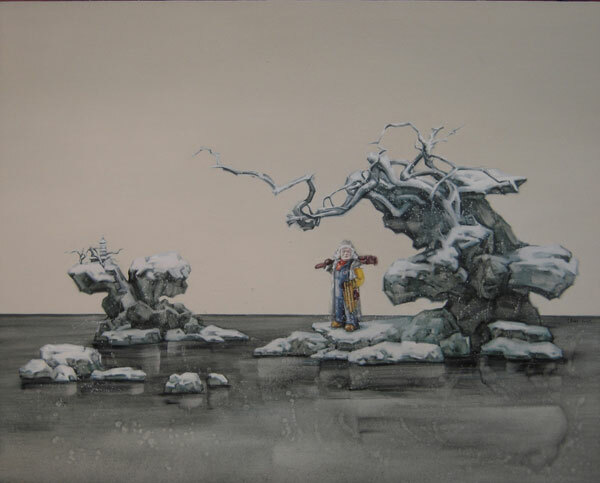 This exhibition is going to introduce nine artists: Sheng Chunyu, Jonathan (U.K.), Hu Qunshan, Du Tianrong, Lu Yanpeng, Guo Peng, Zhao Gang, Yang Wenping and Letizia Werth (Austria). 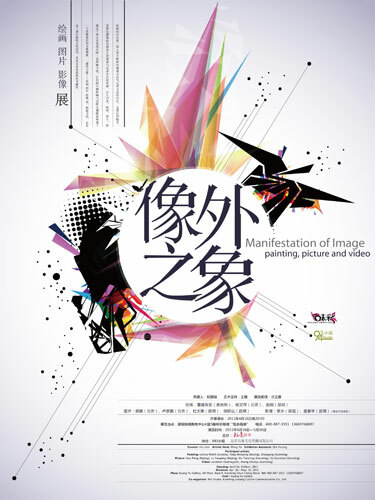 The exhibition involves painting, video and photography. These artworks bring not only a visual feast, but also a presentation of deep thinking and innovation in artistic diction. This time, the actual presentation in the exhibition is no longer painting, video and photography themselves, but the spatial relationships derived from each artwork and the possibility of making them connected. Photography is no longer an independent being; it has been a part of a brand new virtual world. 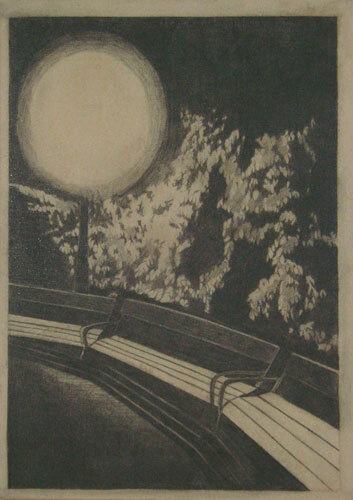 Every artist is trying to reveal the profile of their interpretation from different dimensions in their works. At the same time these works also present an interdependent dialectical relationship among images, which is clear but obscured, weakened but extreme sharp. For the success of this exhibition, we firstly acknowledge the great support from Huixiang Incorporation; we are also grateful to every artist for your participation; we appreciate Mr. Shi Ming, Mr. Luo Fei and Mr. Zeng Yang who recommended so many excellent artists. And lastly, we specially give thanks to Ms. Sha Yurong, assistant of this exhibition who has contributed a great deal of effort to the exhibition. 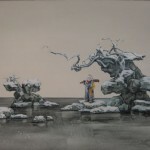 This picture-album is to be dedicated to those who keep concerning and supporting Chinese contemporary art, and the friends of Taste & Color Gallery and Kuang Yu Gallery. Human beings have never stopped exploring the world since the beginning of civilization history. The drawing in early time, as a measure of recording the world, played a role of viewing the world from different angles and interpreting these sights. Ichnographic composition in early cavern fresco and chapel fresco presented a world in which humans and the gods existed together. Humans at that time attempted to establish a spiritual vision system paralleling with the material world through the creation of drawing and painting which imitates the realistic being. In the 14th century, the one-point perspective principle started to be applied in European chapel fresco. After its development during 14th-16th century’s renaissance, a realistic painting system centering on one-point perspective theory was established, and the recording function of drawing reached its peak. Photography, invented in France in 1839, also followed the principle of one-point perspective in classic realistic painting, but its function of recording and documenting were quicker and more convenient and greatly challenged the classic realistic painting. Isaac Newton discovered that sun light is composed of 7 spectral color—red, orange, yellow, green, cyan, blue and purple. He made a scientific explanation about the color phenomenon in his Photology. Latter-day color theorists such as Goethe, Jung, A. Schopenhauer, Ostwald, Mensel, R. Arnheim and Eton respectively published their own monograph about chromatology and all improved the chromatics theory system recognized in the contemporary era. Impressionists in latter part of the 19th century applied the scientific discoveries in their painting practice and then further developed a possibility of a new painting technique which cannot be replaced by photography. From then on, color became the leading factor of painting, and even broke through the restraint of form and developed into the abstract art. 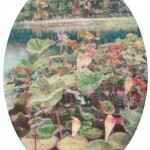 However the realistic painting, another branch of painting was still developing, influencing by photography. Popular Art, which is initiated in Britain in 1950s then thrived in America, directly combined the picture collage with the painting and created a new loose art form with multi-center. Andy Warhol, the representative artist of Popular Art, duplicated the news events and superstars on the picture in a large volume by the means of silk-screen printing. He didn’t care about the significance of pictures, but just liked those large quantities of duplicable and cheap pictures. Photo Realism painting, which was popular in 1970s, engaged in depicting and duplicating the huge images copied from photos. The duplicates are usually larger and more vivid than the original photos, providing a sort of objective and apathetic view of this world. In 1925, John Baird, a Scot invented the first TV camera and receiver. These two important scientific inventions significantly impacted on human beings. Human beings have been more and more used to watching and learning about this world, to look over the place where the visual organ cannot reach by picture, video and television. These technological means have shortened the geographical distance and time span, as well as psychic gap. Human beings were immersed into an overwhelming amount of information and image. Martin Heidegger, a German philosopher had predicted in his time the era of overwhelming images. He mentioned in his Era image of the world: Image of the world is not an image about his world, but refers to the fact that the world is constructed with and learned about as images…..the world did not just simply transform from the middle-ages image to a modern image; or rather, the world in fact has become images. This event symbolizes the essence of modernism. Gerhard Richter, a German artist practiced this concept in his painting. 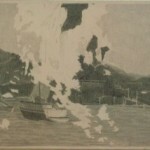 He created a number of paintings which look like photos since the 1960s. Except the size is different from the real photo, it is very difficult for audiences to distinguish these paintings from the real photos. However Gerhard Richter believed he was drawing a photo but not duplicating a photo. In his eyes, the world is a series of quickly shifting images. His painting always brings us a sense of alienation about time flying and that life is but a dream. Compared with paintings, pictures and videos are more functional at recording because pictures and videos are more random and are easily duplicated, while the image in a painting is a result of the artist’s deliberate thinking. 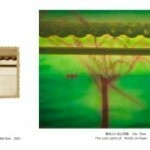 Today, the interaction between painting, picture and video becomes more and more profound. Some artists can freely apply these artistic approaches in their art work creation, and even intercross and incorporate them together, to pursue a breakthrough in the practice of media diction boundary. And it is important that the picture and video impact the painting, though, the significant painting always means much more than the form of image does. They care more about the world hidden behind images, with which the artists are fascinated and can dialogue. And painting to picture and video is vice versa. Here I attempt to interpret this interaction process through the following valuable artist’s case. 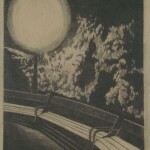 Letizia, an Austrian artist was inspired in her painting by some yellow-old photos. 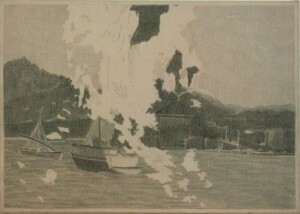 She depicted them with a sketching method, and gradually filtered out unwanted elements in the course of description so the painting tends to be more simple, pure and tranquil. Grey or white homochromy tones cultivated a sentimental sense of looking back to the past. These vague images, like washed-out memories, constituted her memory of the olden days. 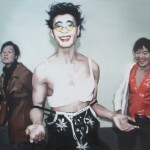 At first glance, Yang Wenping’s painting looks like processed photography works. Only when you look at them carefully, can you find out their details are all piled up layer upon layer by delicate brushwork. This kind of duplication and overlay added to her painting works an amazing sense which is between the photo and the painting. 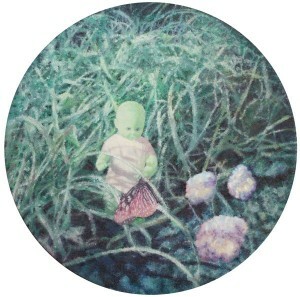 The theme of her painting includes lotus flower, doll and tussock…… cloudy color and drawing drifting inside and outside of images and composing a special viewing situation in which the specific details incorporate with and reject from abstract. 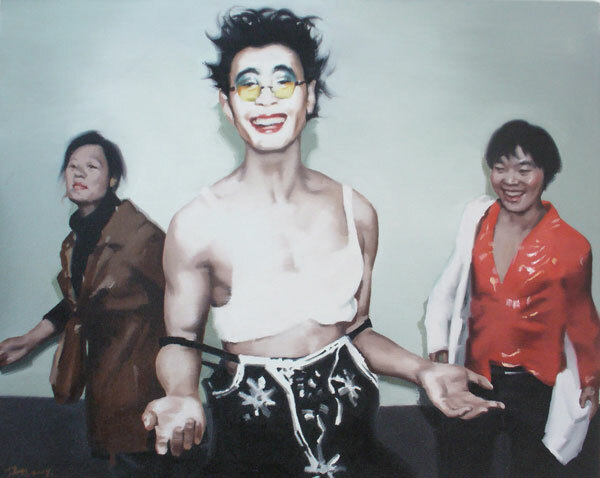 Zhao Gang’s painting is also adopted from copied or downloaded pictures from Internet or news pictures on magazine. 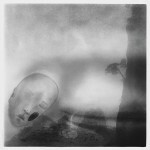 He significantly selected those cryptic pictures, then further obscured and enlarged them to make them more incredible. This obscuration processing brought to these images an effect of being told or untold and stressed a momentary unpredictable unease. 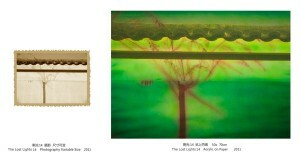 Guo Peng keeps pursuing the manual way, like photo developing and coloring, in early photography technique in his artworks. The artist’s emotion can be exaggerated and reappeared during this complicated and long manual process. His recent art works are enlargements of the pictures he took before in multiples, and then coloring them. 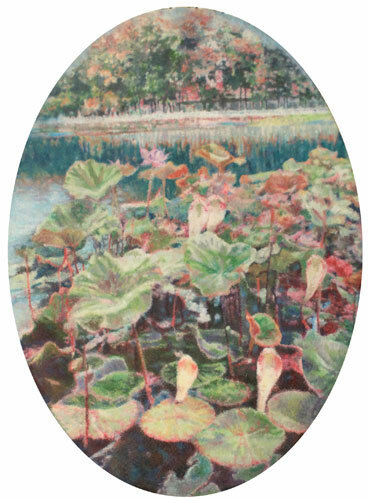 The process of manual coloring is emphasized and exaggerated, as he said; he wants to interpret the poetic world he understood through this approach. 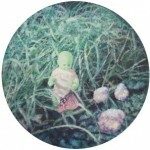 In fact, Guo Peng’s work is abstraction and sublimation from pictures. We can believe at the moment when he pressed the shutter, Guo Peng already understood the poetry of the target. The process of manual coloring just illustrated this poetry. And this illustration is clearly presented when he put the original photo and the processed picture together for the exhibition. Lu Yanpeng’s photography work mostly focuses on the natural mountains and rivers with distinctive framing and composition. 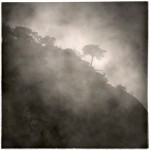 A mountain, a tree, a rock or a river….., covered in a silver grey mist, all appear mysterious and distantly remote. Lu Yanpeng also processed pictures with the computer to add a special dim and visional sense. This kind of sense is cool, leisurely and carefree, close to the inscape for which traditional Chinese scholars were longing. Du Tianrong was the first generation photographer in Yunnan province after the founding of P. R. China. 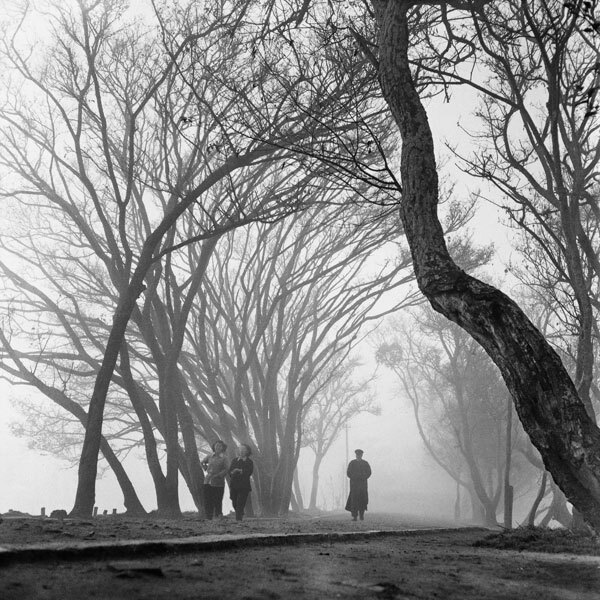 In his camera lens, Kunming, as an ever pastoral city, was full of unique poetry and charm. Different scenic spots in his photography works such as Green Lake Park, Zhuangtang Park, Haigeng Park and Dianchi Lake……, with a dense misty background as in a dreamland, are charmingly beautiful. Du Tianrong must be familiar with the aesthetic spirit of classic western painting. Both the framing and composition of his photo are delicate. All close shot, middle shot, distant shot, ray, and perspective are as same as the authentic structure in classic painting. 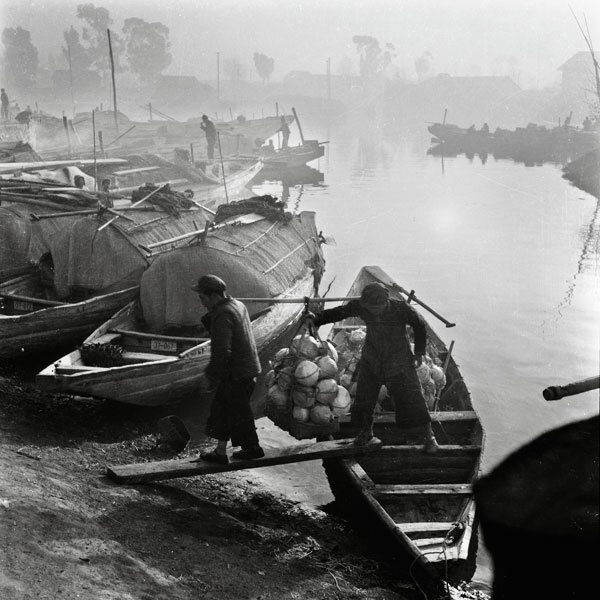 The distinctive intensive sun rays in Yunnan plateau also reappeared in his photography works and remind audiences of the Pleinairismus group which was popular in Kunming urban and suburban areas in 1960s and 1970s. An important school in photographic art since it was invented is documentary photography. It highlighted the advantage of documentary and recording that photography is good at. In the late 1970s, a group of artists in southern California of the U. S. launched a new documentary photographic movement and it greatly influenced many photographers in later time. Alec Soth was the best-known one among them. His photographic work Sleep by the Mississippi River taken in the 1990s presented the ordinary people’s living situation by the Mississippi. Different from conventional documentary photography, the new documentary photography stresses more about the interior feeling of photographer. Behind those optional and careless scenes, there are always the photographer’s strong thought and interaction, dialogue with target objects. The camera lens then is no longer capturing and recording the world in a skimming over the surface way, but is empowered with a directing and rebuilding ability. Artists have been trying to profoundly disclose the natural or social being which is beyond the images and corresponds to the originator’s soul. 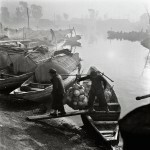 Since the 1990s, some young Chinese photographers started their creation of documentary photography. 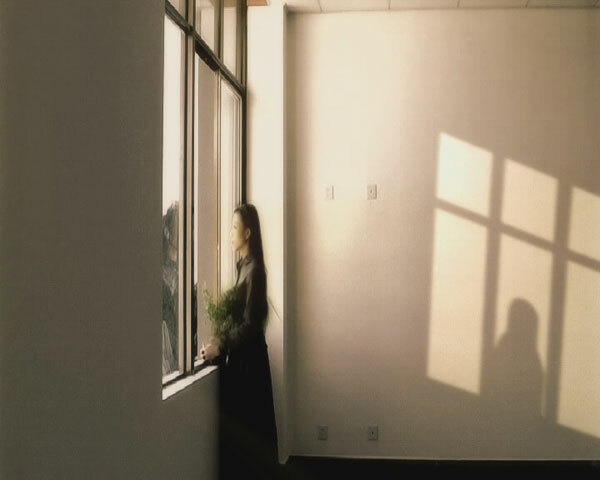 Hu Qunshan, born in the 1970s, as one of new generation photographers in Yunnan has a different focus in her photography from other photographers of her age. She chose Chahe, an unknown small village, as her photography target. Chahe village is located on a hillside with an 1800m altitude in Malu Township, Huize County, Yunnan province. The soil here is seriously deserted, and has always been short of water for years. 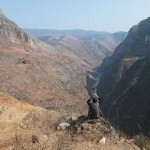 The villagers have to go through a steep mountain track down to Niulanjiang River to get water. Since 2000, Hu Qunshan has been to Chahe village many times, and each time, she lived with the villagers for months. She attempted to commit her strong personal concern into this village through the means of photography year by year. With the camera, she presented the asperity of the environment, the hardship of life, the unavoidability and perseverance of living in her pictures. When she did it, she acted as a calm photographer hiding behind the pictures. Videography technique came forth in 1920s. And in1965, Fluxus artist Bai Nanzhun created a video installation and made the video a kind of new art form. The moving scenes in the video are an extension and upgrade of photographic technique. The early videography was used for its recording function. But in the artists’ hand, it has a magic power of narrative and making dreams. Through subjective directing and narrative arrangement, artists present an intense watching experience with moving pictures. As a dynamic, audio and video synergetic art form, video art has special instigation and influences which painting and picture don’t have. In the mean time, video art also absorbs the experience from the painting and picture so that each frame of video can be classic and immutable. Jonathan, a British artist has been practicing abstract painting all along. His video works seem to decipher and enlarge the process of abstract painting. When the process of the paint flowing is strongly focused and enlarged, a fantastic charm is produced. The slow flowing paint is like dew on the leaves in the morning, they are at ease and breathing…… a lost world is uncovering and emerging. 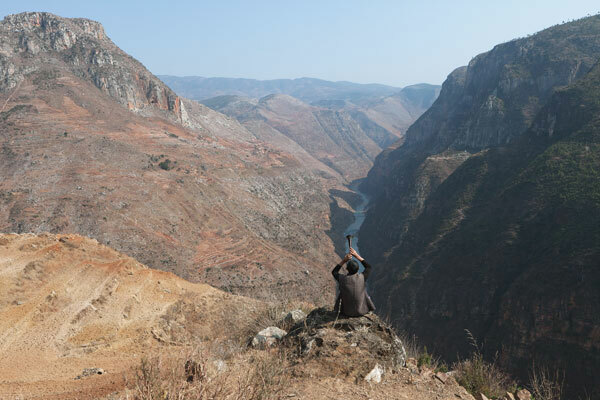 Sheng Chunyu’s video work Forget the river uses the composing principle of the picture for reference. Tranquil scenes are like a series of fixed pictures, and these fixed pictures composed the narrative lines of her video work. Behind slowly going pictures, the goodness and cruelty, permanence and uncertainty, happiness and sadness of life is flowing out and permeated with a blue and peaceful musical background. The emerging and development of painting, picture and video formed the most magnificent cultural manifestation since the 20th century. As beings and recording approaches of viewing and discovering the world, they are witnessing humanities’ never-ending step of exploring the world. Will there be a new artistic approach born in this course? Nobody knows. But we are looking forward to it.